With just nine minutes to go, the full back cut in from the right and 20 yards out, drilled into the bottom corner leaving visiting keeper Matthew Gilks motionless. It was a deserved victory for the hosts too as bar the odd moment of alarm, home stopper Marek Stech wasn't called upon too often, whereas his opposite number had by far the busier of afternoons. Taking the field with a side that could well start next weekend against Yeovil, Luton dominated for large periods against a team who themselves have aspirations of promotion this term, after also suffering play-off heartache just a few months ago. The Iron had the first chance of note in the opening five minutes when Kevin van Veen took aim from 20 yards with his curler not missing by much. Luton saw plenty of the ball, but couldn't create anything meaningful in the opening stages, Pelly-Ruddock Mpanzu spinning away from a challenge and driving forward before hammering over, Andrew Shinnie doing the same shortly after too. Scunthorpe were ahead on 18 minutes as the home defence were caught out by a ball over the top, as Hakeeb Adelakun beat Alan Sheehan's sliding intervention, and although his effort was excellently saved by Stech, Paddy Madden pounced to prod home the rebound. Luton were level just four minutes later though when Isaac Vassell got on the wrong side of Murray Wallace and went to ground. On first glance it looked like the offence happened outside the area, but after a few seconds of confusion, referee Alan Young eventually pointed to the spot. James Collins took responsibility from 12 yards and convincingly sent Gilks the wrong way to net his fifth goal of the pre-season campaign. Conor Townsend tried to restore the lead from a free kick that was too high, while Shinnie should have done better than drag wide from just outside the area too. Luton started to up the tempo midway through the half, Alan McCormack drilling a lovely crossfield pass to Vassell, whose touch was perfect before Gilks saved with his legs. The visitors might have moved back in front before half time as Luton gave the ball away in midfield, allowing Iron to counter, with Adelakun playing in van Veen whose effort was too close to Stech. McCormack saw his thumping attempt from range well handled by Gilks, while in the second period, Madden headed van Veen's cross over under pressure from Stacey. Sheehan showed he had lost none of his free kick accuracy over the summer, his 25 yard effort caught by the sprawling Gilks, as the impressive Shinnie continued to find pockets of space, sending Vassell away on the left, his rifled left-footer forcing the keeper to use his legs once more. On 65 minutes, Town had another let off as Stech came racing out only to make a hash of his intended clearance and Madden's lobbed return appeared destined to ripple the net, only to bounce over the open goal. Town made a couple of alterations as the half progressed, Olly Lee, Elliot Lee and Jordan Cook all coming on, as they fluffed a great chance when Collins brought a long ball out of the sky for the onrushing Stacey, but just five yards out, he could only hit the prostrate Gilks. Stech then made amends for his rush of blood with a super stop from Johnny Margetts, producing a strong left hand to divert his low attempt behind. With nine minutes to go, Luton took the lead for the first time as Olly Lee, who had already picked out brother Elliot twice with unerring accuracy, teed up Stacey to find the bottom corner with a strike reminiscent of his effort for Exeter in the play-off semi-final, although not carrying quite the same significance. 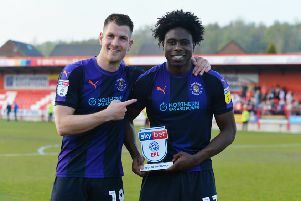 In the final moments, Cuthbert prevented Madden from drawing Iron level, tracking back to send the Iron striker wide, as Luton left the field with victory under their belts, a feeling they will be determined to replicate in seven days time. Hatters: Marek Stech, Jack Stacey, Dan Potts, Alan Sheehan, Scott Cuthbert, Alan McCormack (Olly Lee 65), Pelly-Ruddock Mpanzu, Andrew Shinnie (Jordan Cook 72), Lawson D'Ath (Glen Rea 85), James Collins, Isaac Vassell (Elliot Lee 72). Subs not used: James Shea, Luke Gambin, Johnny Mullins, Jack Senior. Iron: Matthew Gilks, Jordan Clarke, Conor Townsend, Murray Wallace, Funso Ojo, Paddy Madden, Kevin van Veen (Devonte Redmond 65), Neal Bishop (Johnny Margetts 65), Hakeeb Adelakun (Duane Holmes 65), Cameron Burgess (Josh Morris 46), Rory McArdle. Subs: Tom Hopper, Charlie Goode, Levi Sutton, Kyle Wootton, Rory Watson.